For most of the information in this profile we are indebted to Mr. Morris’ son and daughter who were kind enough to respond to my approach. Their cooperation is greatly appreciated. Howard Morris was a well-remembered and much loved member of staff among boys who attended CHSB in the period from after the Second World War through to the early 1970s. He was born in Llanelli, South Wales on 3rd. December 1912. He attended school in Wales before going to King’s College, London where he gained a degree in geography. While there he played rugby for the university and London Welsh. He was also to gain two caps for Wales. On leaving university he worked in a number of private schools in the Leatherhead – Esher area until the outbreak of the Second World War when he joined the Royal Artillery as an officer. He served in the Eight Army in Tripoli and subsequently in Sicily and up through Italy, where he witnessed the body of Mussolini hanging from a lamppost. He achieved the rank of Captain, being discharged at the end of the war. He had hoped to return to Wales to teach, but found being non-Welsh speaking an obstacle, so he sought work in England and joined Chichester High School for Boys as a geography teacher in the summer term of 1946. He married Norah (from Pembrey, South Wales) in 1947 and lived in Bognor Regis for the following 25 years. During his time at CHSB he studied and secured an external London University degree in English and was also an examiner for London University exams. 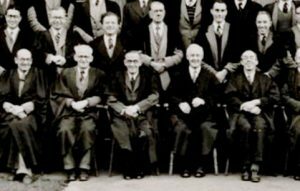 On joining the school in 1946 he was attached to St. Richard’s House as an Assistant House Master becoming the Senior House Master in 1953. Old boys of St. Richard’s House will remember him as an enthusiastic housemaster. His St. Richard’s House reports in The Martlet magazine always reflected his particular fun-loving personality. Among my particular memories are of him playing centre forward for the Staff in the in the annual football match against the First XI where the watching boys loved to see him ‘belly barge’ the school goalkeeper. Some old boys may also remember the rugby matches between Mr. Morris’ XV and Mr. English’s XV. He died very suddenly at a family wedding in Wales in 1972 and is buried together with his wife, who died in 1992, in the small village churchyard in Pembrey, South Wales. The couple had two children – Tony, who has a dental practice in Bognor Regis, and Rosemary, who became a teacher of English and now lives in Launceston in Cornwall. Howard Morris loved rugby, playing the piano and playing the fool! He had a tremendous sense of humour and was happiest when everyone was laughing at his antics. He was fluent in French and loved taking holidays in the South of France and in the Welsh mountains; he had hoped to retire to a cottage in Wales.